Trekking Pu Luong,Vietnam_ a walk in the cloud! Trek it , explore it and support it. This morning I received an email from Heiwig, my Austrian travel companion, with regards to the picture of us taken during the trip to Pu Luong. My heart skipped a beat when thinking about Pu Luong and the great 4 day trip I joined with Heiwig and his “gang” from Austria. After leaving Hanoi behind on a cold rainy day, we arrived at the entrance of Pu Luong Nature Reserve area after lunch and started our walk to the village of Hang where we spent the first night. It was great to breathe in fresh air and discover the local life. It was still raining but the view of green mountains and deep valleys covered by a white blanket of cloud and fog make our walk like “ a walk on the clouds”. It didn’t take long to reach Hang Village, we settled in a Thai traditional stilt house, had dinner with delicious food and warmed up with a round of home made rice wine. The next morning we woke early, everybody was in high spirits as it had stopped raining. We said goodbye to our hosts and walked through Hang village and embarked the hillside path, crossed over a wild rocky stream. We passed several peaceful Thai and Muong villages along the green valley between two giant mountains. It was a challenging trek from Ban Hang to Eo Ken on the second morning, trekking from the valley up to the secondary road C15. The cloud stayed low and it was humid. The day was full of surprises, after lunch we passed by Dong DiengVillage and got lost in the most breathtaking scenery ever. 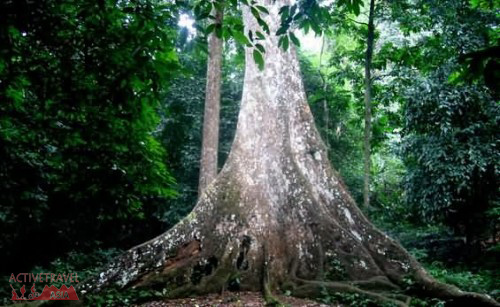 We walked on the red soil road, which lies like a king snake through the green mountain, when wind blew cloud away we could see deep into the forest – giant trees with their white smooth trunks and wild banana flowers blooming. In another second, the cloud closed up and we floated along the cloudy road again. The highlight of the day was when the valley of Kho Muong appeared in front of us. It was the picture of a happy, peaceful village with a small river feeding water for all. 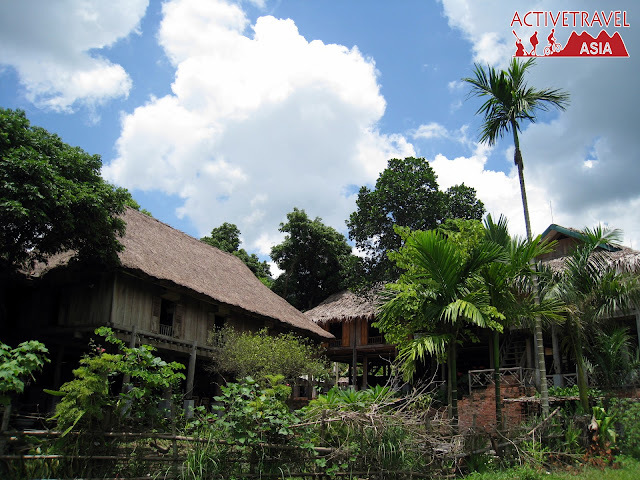 We found Mrs. Be’s stilt house at the end of the village and were warmly welcomed into a relaxing household. We had a good rest and got ready to cross over the mountain the next morning. The mountain was an exciting challenge. The rocks here are like sharp cat ears so they called it “cat ears rocky mountain”. We spent almost three hours hiking to the other side of the mountain. The feeling when you reach the flat land again is always great and we were very happy to see a cold beer when we reached our next village. As we continued trekking, we reached the biggest market in all over Pu Luong area and spent our last night at The Nature Reserve Office building. That night at Pho Doan market we shared a sleepless night with beers, songs and lots of stories we would bring home to share with our dearest friends. We ended up our trip with an awesome “xe om” motor bike ride from Pho Doan to La Han ferry, where our driver was waiting for us. Holding on tight, I silently said goodbye to the mountain we were leaving behind. Pu Luong is a destination I would love to return to and spend longer than four days. For Heiwig, his family and me, we shared an unique experience with Pu Luong in a time where the sky met the mountain and we walked in a dreamlike scene, Pu Luong – A walk in the cloud! 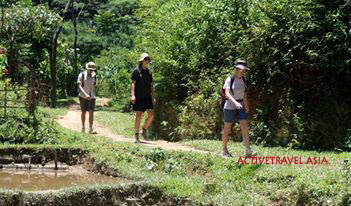 Arriving in Pu Luong Nature Reserve where there are immense green forests and green terraced fields, tourists seem to be lost in a valley, completely separated from the outside world, with many mysteries expecting to be discovered. 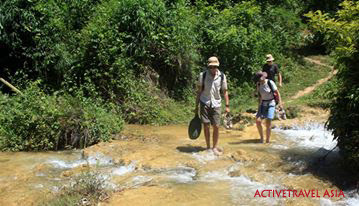 With many foreign tourists, Pu Luong Nature Reserve is the interesting ideal for trekking trips or cycling options. Biking in Pu Luong is one of the best ways to discover the natural beauty of the region and exotic culture of minority groups. 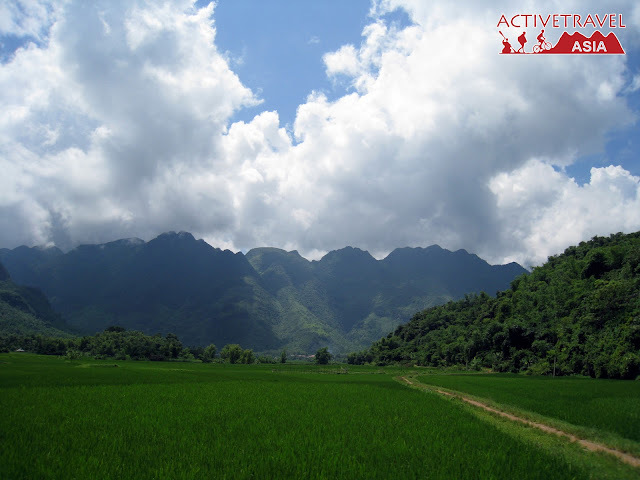 Biking Pu Luong Nature Reserve: On biking tour we will ride on the first part of the historic Ho Chi Minh Trail and spend 3 nights in villages of Thai people. Is It Safe To Ride A Motorbike In Vietnam?